Everyone is scared of seeing a shadowy figure through the sheer plastic of a shower curtain. You can now get that spooky chill down your spine every time you step into the bathroom with the Bloody Bath Shower Curtain. Your guests and family will sit and ponder exactly whose bloody handprints are gracing your shower curtain when you hang this twisted bathroom accent. When was the last time they saw Aunt Sara? 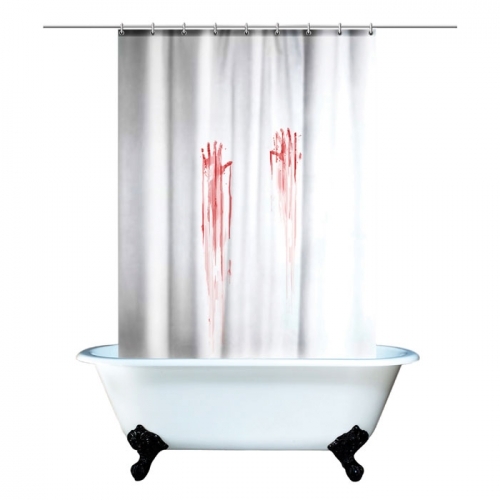 The Bloody Bath Shower Curtain is the ideal gift for any horror lover or likely serial killer. Who doesn’t love a little suspense in their life? 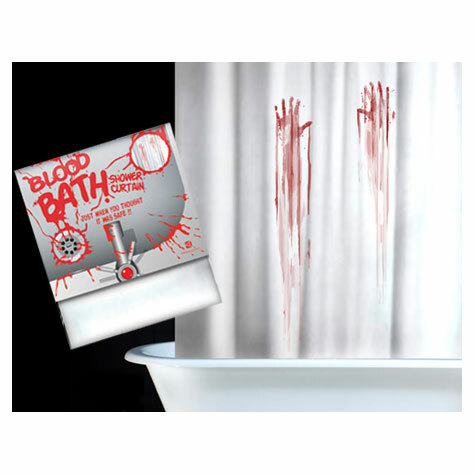 The Bloody Bath Shower Curtain just stood out as an awesome accessory for anyone that loves horror and thriller movies. The good news is no one actually died while making this curtain, but your guests don’t have to know that. - Approximately 71" x 71"
Who Will Love Showering With A Bloody Bath Shower Curtain? What kind of sick freak..er…awesome dude would like something like this? This is the perfect gift for that serial killer on your list or your widowed aunt who just got married to her fifth husband. Horror movie buffs will think this shower curtain is the bomb and your police friends will enjoy it as well. Will This Fit My Shower Curtain? Yes, unless you have a seventy foot long shower, this should fit most standard models. It’s easy to install and you can be showering with bloody handprints after only a few minutes. I had a similar pattern on my old shower curtain after a rather unfortunate manscaping accident, but it washed off. Will these blood stains stay there? Yes, it’s just a righteously creepy print. The handprints will stay on the shower curtain, but may make any future manscaping extra tense.